339 W El Roblar Dr. The Farmer and the Cook is vegetarian restaurant with lots of vegan options and lots of indoor and outdoor seating. We stopped in on pizza night so I had to try one of those! I ordered Kenny's pizza and added marinara sauce as well. 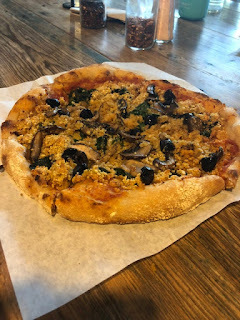 It was really good but their cashew cheese was more like a cashew crumble, which some of us were not a fan of. I would stop in again and try some of the other vegan options they have on offer. Bliss is your run of the mill fro-yo place but it offered a almond milk fro-yo and plenty of vegan friendly toppings. It was pretty hot out so we decided to stop in and get something to cool down. My base was the almond milk flavor, which was the only vegan option. I topped mine with dark chocolate chips, Oreos and Hersey’s chocolate syrup. It was very tasty and did the trick of cooking me down. The place is very cute with spoons that change color and beautiful murals on the ceiling but it would be nice if they had more than one vegan fro-yo flavor. This grocery has it’s own deli and lots of great vegan options for you to take home room from the grocery section. The deli menu offers quite a few vegan options though they were out of many of them when we were trying to order. 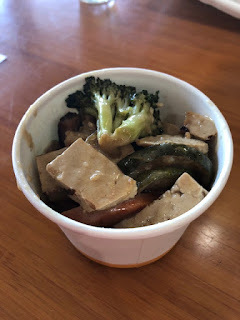 I ended up with the garden burger with veggies and tofu, which were better than to be expected coming from a grocery store. I also picked up Japanese Tea cakes, which were pretty dry but really good! I would have like to try some of the other vegan options they offered, but as I said, they were out of many options. I would for sure stop by again and have a meal or pick up some groceries to take with us. 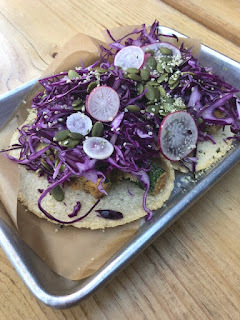 The Nest is a very trendy new (as of July 2018) restaurant that has some great vegan options. 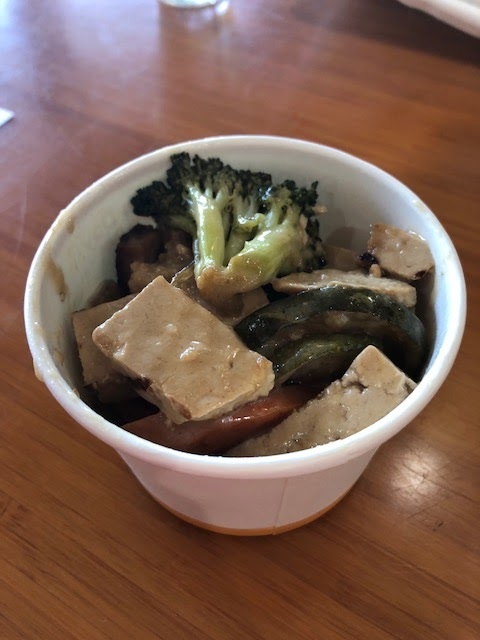 Unfortunately none of the vegan options are clearly marked but we asked and the person that helped us was very helpful explaining the options to us. Some of the options included a mushroom burger, pizza and the zucchini tacos. I opted for the zucchini tacos which included a spicy cheese sauce. These were delicious and everyone else seemed to really like all of the vegan options they had. 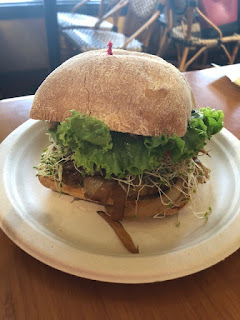 This place will definitely become a hot spot in Ojai for visiting or local vegans. 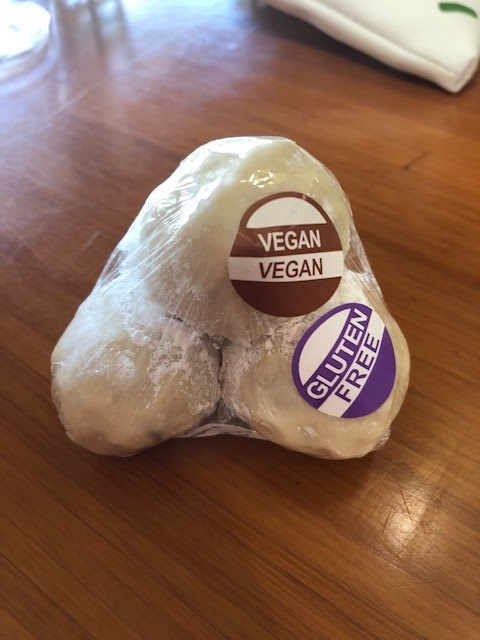 One thing to note, they did make a mistake and bring one of the burgers on a non-vegan bun and then insisted that it was the vegan bun until another server agreed that it was in fact not the vegan bun. Since they had just opened, this could have just been opening pains but make to to confirm everything when you receive your food. What are your favorite vegan spots in Ojai? Let me know in the comments!